Desperate to know the truth, the Lansquenet’s solicitor turns to Hercule Poirot to unravel the mystery. For even after the funeral, death isn’t finished yet . . .
What a pleasure to once again read an Agatha Christie novel, especially one of the Hercule Poirot Mysteries. Always page turners and engrossing reads, her characters are lovely, the pieces of Poirot’s puzzles intriguing, and the settings scrumptious! Loved this book. If you want a crash course in imaginative motive...read Dame Agatha's books. This was outstanding.. all the clues are in there... but how she places is quite ingenious. A Super Read - A Five Star for sure! 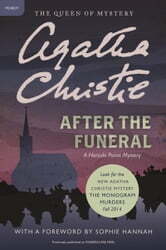 I have read a number of mysteries and always enjoy an Agatha Christie story. After the Funeral kept me guessing right up until the end to find out who was responsible for the murders. Hercule Poirot character always entertains!